At Dance Connection, we are dedicated to the dance education of children and adults in the art of dance. At Dance Connection our classes are divided by age and ability. We limit the size of classes to ensure productive learning and high teaching standards. Our students learn to work with other dancers and develop natural motor skills in a fun and creative way, while learning technique and dance skills. Classes are instructed in a caring and motivated environment for all ages and in many dance styles. Dance Connection was established in 1987. Denise Ronco’s vision was to expose as many children to the art of dance as possible, by offering reasonable rates. Dance Connection is based on a family atmosphere. Many former students are now instructors and continue to teach their passion for dance and self expression. Dance Connection instructors continue to expand their knowledge by taking classes with instructors from all over the country to keep up on the latest dance techniques and styles. Giving back to the community is one of our greatest rewards. By organizing and producing annual charitable events, our Dance Connection family has contributed over $100,000 for various children and adult charities (Webster Comfort Care, Hope Lodge, Gilda’s Club, Seneca Park Zoo, Mary Cariola’s Children’s Center, Journey Home, Golisano Children’s Hospital, Breast Cancer Coalition, Cobblestone Arts Center, Dream Factory, Light the Night, Alzheimer's Association, Muscular Dystrophy Association, Verona Street Animal Shelter, Genesee Valley Rotary Camp, SIS, IacKids…).! 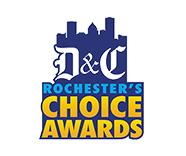 We are also members of Dance Rochester! and Dancing Out Loud, Ltd.